I know it's old hat now, but this could be a Daily Mash/Onion quote. NickSCFC wrote: How has this Rees Mogg character become so prominent? For some mind-boggling reason the Tree Frog is massively popular with the party membership. Mind you, the tiny collection of 70,000 members of the the Conservative party are probably half-senile at this point in their lives and would vote for parrot provided it could be trained to talk in a posh enough accent. The party as a political entity is living on borrowed time (their membership is dying off at a devastating rate and the process is probably irreversible at this point) but if he became leader it would probably hasten their demise by at least a decade. He would make Corbyn seem like a really sensible choice for PM. Tree Frog is such a good one. The Tory membership is quite old but they do have some youngsters still sadly. I knew two people who whilst at university were members of the "Young Conservatives". Even at the time it sounded like a ludicrous oxymoron of an organisation, what the strawberry float is wrong with you that as a young person you don't have the hope, determination or imagination to believe in something better than the strawberry floating Conservatives? Quite quickly this descends into badly-written cyberpunk. "This could include exploring how machine learning and artificial intelligence could allow traders to automate the collection and submission of data required for customs declarations," it says at one point, as if the civil servant writing it got bored and just thought they'd chuck in as much crazy nonsense as possible. At least he waited until he’d left Canada and France before shitting on them. Murdoch’s hands personally all over setting this one up. Obama shouldn't be interferring in our politics!!!!!!!!!!!!!! Lets throw away the majority of our trade deals in the hope that we get one from the most narcissitic unpredictable strawberry float in the universe. Did the Sun actually get an interview with him? That front page is abhorrent. Yes, it’s a genuine interview (video is on The Sun’s website, conducted prior to his U.K. visit). Murdoch obviously been directly involved setting this up, as Trump is also very close with Fox News. Trump also gave an interview with The Times a few years ago (with Michael Gove, and which Murdoch secretly sat in on). 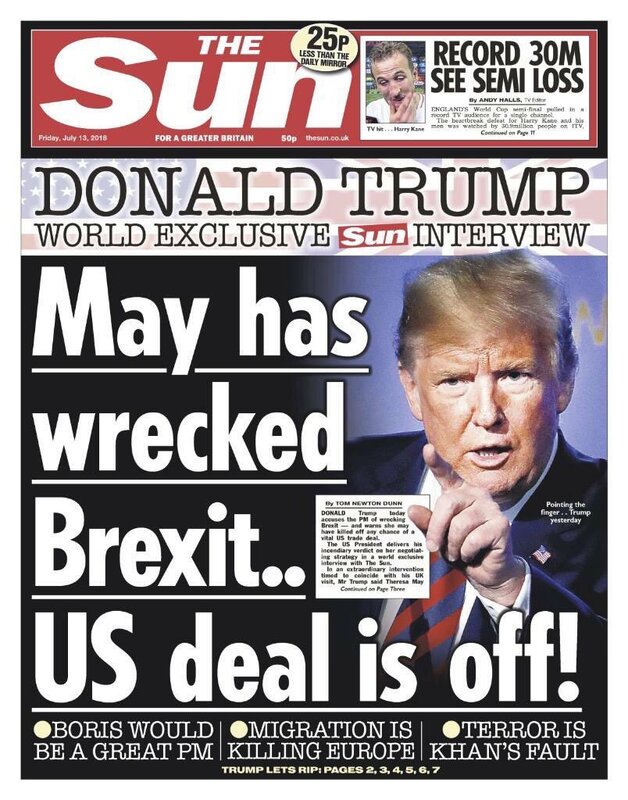 Asked about a report in The Washington Post that he thinks of Mrs May as “a bossy schoolteacher”, Mr Trump said: “No, no, no, no. I never said anything bad about her. Imagine appeasing Trump's neo-fascism to just be completely undermined by him. What a horrendous front page. A dark day for the UK. “MR President, these gentlemen are from The Sun,” an aide formally announced as we were ushered into the Trump inner sanctum. Entering the court of an emperor, it pays to bring a gift. We presented him with an England shirt when we interviewed him at the US Embassy in Brussels on Wednesday, ahead of the Nato summit. “Oh wow. I love gifts,” he said, happily obliging our photographer Paul Edwards by holding the personalised top up with a trademark grin. “You don’t hear the word England as much as you should,” he continued. Two things about him struck me most. First, Trump has total power. Nobody on his White House staff tells him what to say, or questions him when he says it. I hope we never invite him here again.